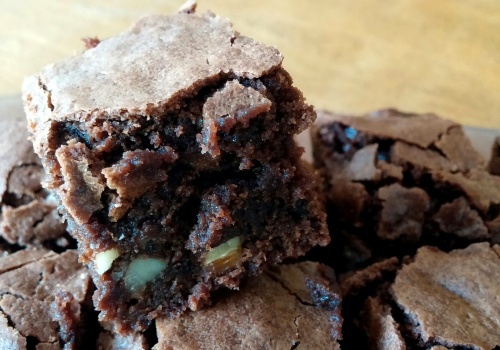 Easy Brownies: you would be hard-pressed to find a simpler recipe – even one from a brownie mix. There are several reasons this recipe is so easy. There are just 5 ingredients (okay, 6 if you count the optional chopped nuts.) Like a mix, this recipe uses just one bowl. You can mix the batter by hand – just grab a wooden spoon. Thanks to the melted butter, there’s no need to measure oil and water, which can lead to a mess. The only measured ingredients are dry. In less than ten minutes, these brownies will be in the oven. Line an 8 x 8 baking pan with aluminum foil, allowing ends of foil to extend over two sides of the pan. Coat the foil lightly with vegetable spray. Set the butter in a microwave-safe dish and cover it with waxed paper. Microwave on high for 30 seconds to melt. Stir. If not completely melted, microwave on high for 15 seconds more. Measure granulated sugar into a medium-sized mixing bowl. Pour melted butter into sugar. Use a large mixing spoon or a mixing spoon to combine the sugar mixture. Whisk in eggs, one at a time. Stir in cocoa powder and flour until the batter is well-blended and dry particles are absorbed, about 50-60 strokes. Fold in nuts. Pour brownie batter into prepared pan. Spread evenly. Bake 25-30 minutes until set and a toothpick inserted in the center comes out clean. Do not over bake. Remove brownies from the oven and allow the pan to cool completely on a wire cooling rack. Grasp ends of aluminum foil and lift the brownies from the pan. Peel away foil. Cut brownies in five rows of five (or in any other size you wish.) Or cut them into shapes with cookie cutters! You may choose to grease the baking pan rather than lining it with foil. Pay special attention to applying plenty of shortening to the pan’s corners and sides. Keep in mind that in doing so, you will need to cut the brownies while they rest in the pan and remove them using a spatula.